There are always some high and lows that come with the release of the new Annual Catalog. There are new products on their way, but there are also products that are leaving us. I am fortunate enough to have at least 75 stamp sets that are sticking around. Sometimes as demonstrators, we place most of the spotlight on new products that we neglect the items that are sticking around. So, this year, my plan is to ensure that I incorporate returning products into my schedule. 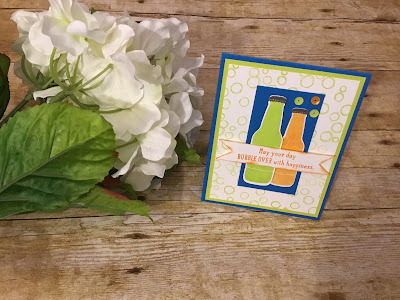 Today, I am sharing a swap card I have received using one of my favorite bundles from the Occasions Catalog. The Bubble Over bundle is still available to order and you will receive a 10% discount. After June 1st, the discounted bundle will no longer be available.